Widget predicts global port tides. Is there a better alternative to TideApp? Is TideApp really the best app in Adventure category? Will TideApp work good on macOS 10.13.4? TideApp brings tidal data right to your desktop. 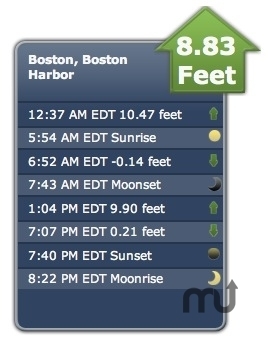 The application displays the current tide conditions, along with daily highs and lows with their accompanying times. Will support multiple instances, so feel free to add 3 or 4 or dozens of widgets to your Dashboard! New ports for Africa, Australia, Japan, Spain. TideApp needs a rating. Be the first to rate this app and get the discussion started!